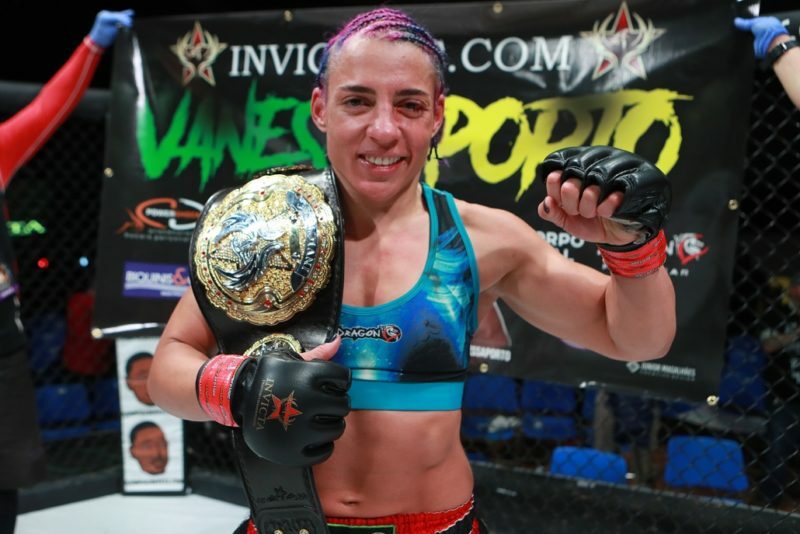 Kansas City, Kansas – Invicta FC 34 features a slew of interesting flyweight fights as the vacant flyweight belt will finally be in contention. Vanessa Porto looks to make it three straight finishes as she faces a tough challenge in the form of Pearl ‘The Chi-Town Princess’ Gonzalez for the belt. Invicta 34 also showcases the start of a flyweight tournament to decide the next contender in line. Dudieva vs. Rodriguez and Bennett vs. Maverick are set to put on a show in order to prove their credentials for the next shot. To read up on all the action as it unfolded, check out each matches notes and highlights from the enticing main card match-ups. The title fight got underway with a fiery pace as Vanessa Porto and Pearl Gonzalez exchanged looks. Porto countered the kicks by cutting the space and forcing Gonzalez to fight off the cage. Gonzalez did well to maintain a short frame and keep under hooks when Porto pressed with physicality. After some struggle, Porto works her way down to stacking on top of Gonzalez, but lets up in order to dish out damage from different angles. After peppering in some jabs and straights with Gonzalez against the fence, Porto once again established control from top position to secure Round One. The striking exchanges became a lot more lethal with the progression of the fight. Gonzalez started to unwind with a repeated straight right into left lead-hook combination, but Porto didn’t hesitate to read the gameplan. 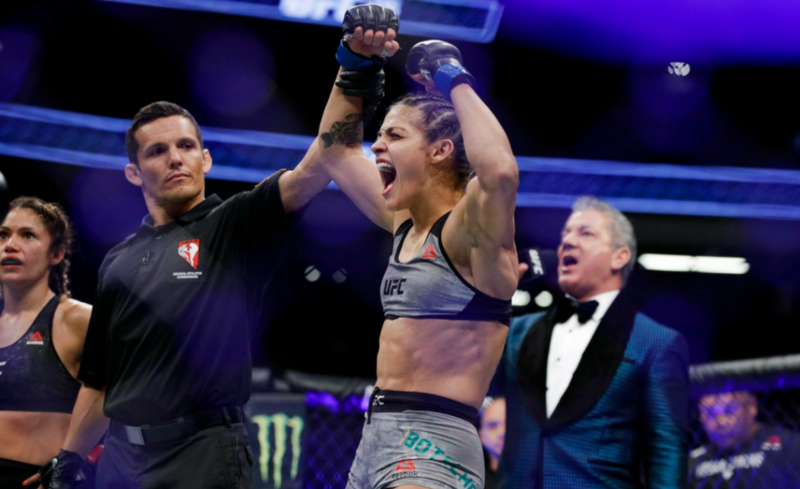 After another clinch exchange, Gonzalez attempted to slam her opponent into the canvas with a controlled headlock but Porto remained poised. Her control on the way down enabled her into top position where she secured control for the next few minutes. Porto just started to posture up in order to land significant strikes from above, but her damage output was cut short by the ending of the round. The output in Round three started to dial back a little bit as Gonzalez and Porto both seem affected from the bout. Porto eventually worked Gonzalez back to the cage and seized up her legs in order to secure another takedown. Porto’s pressure from the top has been proving to be more than Gonzalez can handle and the effects to her cardio have been palpable. A quieter round in comparison to the last two, but Porto walks away the victor due to her dominance. The fourth round saw Gonzalez come out with a little more fervor as the rounds are starting to stack against her. The exchanges started to get a little chippy, but Porto saw her night cut short. A stray finger in the eye from Pearl Gonzalez ended up affecting Porto more than she cared to admit. After a look from the Doctor, Porto was ruled ineligible to compete and the fight subsequently called off. Like last fight, the first few minutes of Dudieva vs. Rodriguez were tentative to say the least, until the action broke. After Karina Rodriguez started to loosen up with combinations, Milana Dudieva wasted no time in finding her takedown and secured a double-leg after teasing an overhand right all fight. Dudieva then maneuvered quickly into side control as Dudieva started to reign down strikes. The final seconds finished with Dudieva inflicting dangerous strikes to her opponent. Dudieva continued her onslaught in Round Two as she found a spinning back fist that hurt Rodriguez. The Mexican born fighter did well to recover in quick fashion. Even still, Dudieva hasn’t relented in putting on more offense from the clinch and ground game as Rodriguez struggles back to her feet. Both fighters are putting out offense at an eclectic pace though. Rodriguez is holding up admirably well in spite of the adversity. Dudieva remains staunchly aggressive in order to counter her perseverance. Rodriguez and Dudieva finish the round in an absolute barn burner as the crowd in Memorial Hall roars in approval. Rodriguez opens the third round with more mixed striking as she settles into her role as aggressor in the early minutes of Round Three. Dudieva is remaining light on her feet as she still teases the spinning back fist in hope that lighting strikes twice. Rodriguez’s footwork is keeping her afloat as she stays away from danger while still peppering in her jab. Dudieva closes the round with a surprise takedown and 30 seconds to spare. In an action packed co-main, both fighters proved worthy of their credentials in this role as the judges decision could go to any fighter. Both fighters come out relatively tame as the stakes for this fight are immediately felt. Miranda Maverick finds some success with her kicking, but DeAnna Bennett is refusing to engage her in a static manner. Bennett pins her opponent against the cage as she finds her opening to engage her grappling. She forces Maverick to the ground, but Maverick’s high guard is proving to be a frustrating puzzle to figure out. Bennett likely edges the round with her offensive positioning from the ground. A bit of a role reversal starts to take place in Round Two as Bennett starts the round establishing her strikes. In return, Maverick tries to barrel her shoulders into Bennett to establish some posture in the clinch. Instead, Bennett uses this change of plans as another opening to land a takedown and establish back control. Maverick’s defense of the choke is a stubborn one as she eventually finds her footing to rip free from grip and stand back up. Maverick finishes the round on top and uses Bennett’s eagerness to finish as a way to regain control for her in this bout. Round Three of this flyweight tournament bout stayed contentious as both Maverick and Bennett started to look for strikes. Maverick found success with a lead shovel hook that immediately gave way for her to engage the clinch. In this realm, Bennett continues to prove herself as the stronger fighter as she refuses to give an inch of space to Maverick to establish any kind of useful position. All in all, both fighters remain evenly matched as the fight for under hooks against the cage remained the biggest point of contention. Erin Blanchfield and Tracy Cortez traded jabs early as both fighters found a home for their strikes. Blanchfield eventually worked her way into clinch range and imposed her will with grappling. Her stockier frame worked well to stack on the pressure against Cortez as she nearly secured the round with a flurry of dangerous submission attempts. Blanchfield enjoyed a relatively controlled position on top for the remainder of Round One. Cortez put on the pressure early in the second with some big strikes and high kicks that affected her opponent slightly. Blanchfield countered with clinch engagement but Cortez remained poised against the leg grab. Cortez backs up to the cage and quickly switches positions to begin breaking down Blanchfield for positional control. 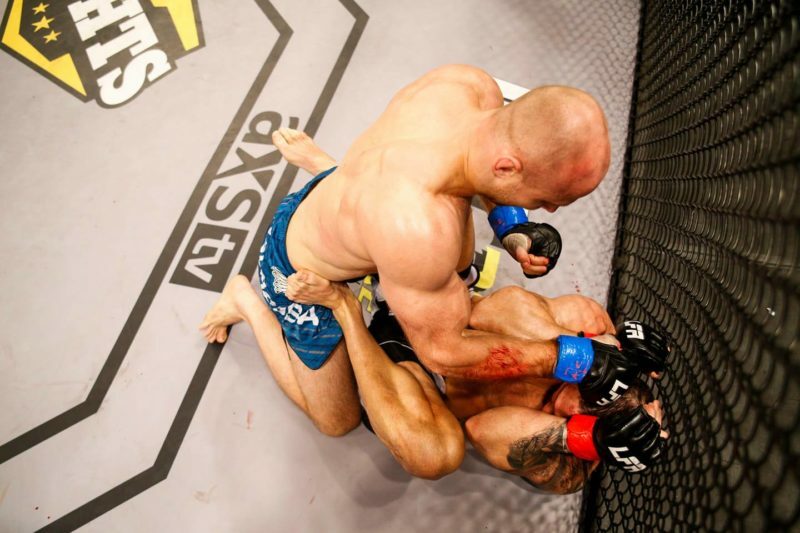 The wear and tear from a costly defense on the cage eventually led to Blanchfield attempting another armbar in the dying seconds of the round. Cortez opens round three with an excellent exhibition of strikes. The mix up of offense starts to pay dividends and Blanchfield is forced to tie up once again. Blanchfield remains efficient with her grappling and forces Cortez into a compromising position while in side control. The suffocating pressure from Blanchfield has seemingly become the difference maker between these two opponents. The New Jersey native continued to put pressure and remain creative in hopes to finish the fight. In the end, Cortez’s durability remained unbroken, but Blanchfield could’ve taken the fight on the merits of control. Jamie Milanowski opened the round with an impressive throw after failing a double-leg takedown. Victoria Leonardo did well to recover on the ground and quickly bounce back to her feet. The following engagements mainly came from the clinch as Leonardo broke down her opponent to attain a quick back take. Leonardo finishes the fight in emphatic fashion with a fantastic RNC adjustment that secures her the victory at just 2:45 into the first round. Holli Logan came out of the gates swinging and found success at the end of her straight right hand many times. After eating a few strikes, Courtney King started to find success with the clinch to stifle Logan’s offense. Hand fighting remained fierce up on the cage as Logan refused to give under hook advantage. King eventually found a takedown with thirty seconds to spare in the round. King most likely edges the round with her final minutes of control. Both Logan and King start Round Two with a wild flurry of strikes. Logan seems more comfortable in the red zone, as King forces the fight to the cage to engage clinch control. King uses Logan’s faulty posture to hold a head lock in place, but can’t fully maneuver that pressure into something more dangerous. King used much of the round to sap out the energy of Logan from this dominant position nonetheless. After a few strikes from mount position, Logan gives her back in defeat and King is able to cinch in the rear-naked choke in the dying seconds of the round. Christina Ricker opened the initial round with a crafty lead left hook. Sammons kept the forward pressure in the clinch, which eventually gave way to a wonderful double-leg takedown. With three minutes left to go in the first, Sammons controlled the position and nearly finished the fight via arm bar if it wasn’t for Ricker’s toughness. Round Two was much of the same for Sammons as she found her opening early. Ricker kept forcing her way into range with jabs, but Sammons’ teep kick stopped her opponent in her tracks. After appearing visibly hurt from a kick, Ricker folded into defense. Sammons quickly pounced on her injured opponent to reign down strikes. Caitlin ‘Ginger’ Simmons notches her first pro win under the Invicta FC banner at 3:02 into the second round.